The Warrior order hall perk that lets you auto-complete quests, called Val'kyr Call (actual spell here) won't work unless I disable Shestak. I get the error that Shestak is trying to do something only Blizzard is allowed and it needs to be disabled. There is no Lua error or anything when this happens, just the dialogue box that pops up. Have the Warrior Order Hall Perk "Val'kyr Call"
The animation plays, but the world quest does not actually complete and the ability doesn't go on cooldown. 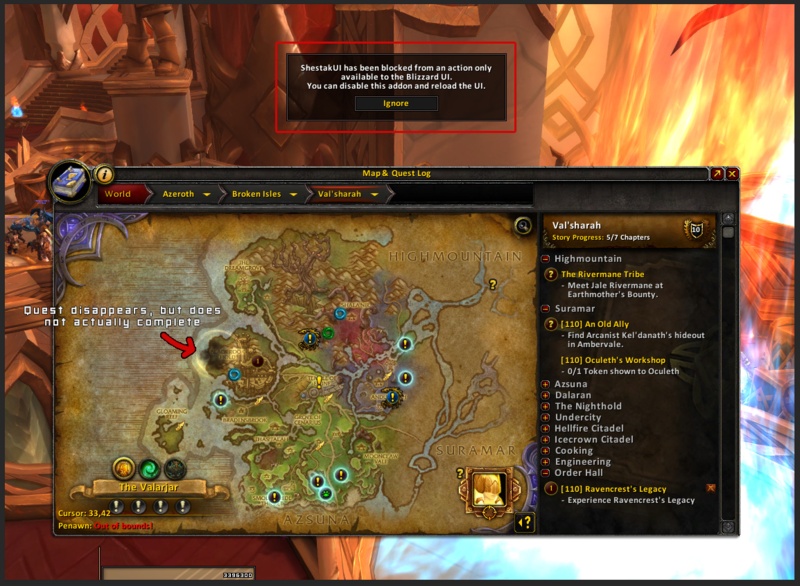 The world quest is gone from the map until you close and reopen it. If I disable Shestak the ability functions as normal. Delete this lines https://github.com/Shestak/ShestakUI...es.lua#L33-L93 and check again. Deleted those lines and the issue still persists. After some time of testing, that world map taint fix does indeed introduce that world map taint. It could also be related to the code of the objective tracker quest coloring too. Unsure though as I removed that and all was fine on my end. That world map taint fix is not good and should be looked over and changed if possible. Same problem. How can i fix it?